Watching the sun dip below the horizon as you sip fabulous Molokai Mules (our favorite) or Lanai Tais as you sail the warm tradewinds on a beautiful catamaran. Watch the brilliant colors of the day fade away aboard this sailing catamaran with convenient boarding from Kaanapali Beach! Experience Maui's majesty as you explore the West Maui coastline surrounding Kaanapali. By far the best way to view Maui is from the ocean looking back at the breathtaking mountains and beautiful rainbows often seen in the valleys. Enjoy tasty pupus (appetizers) and an assortment of cocktails coupled with world-class service from your talented and knowledgeable crew. Come join Maui's most experienced sailing company for a personalized sunset that boards directly from Kaanapali Beach! 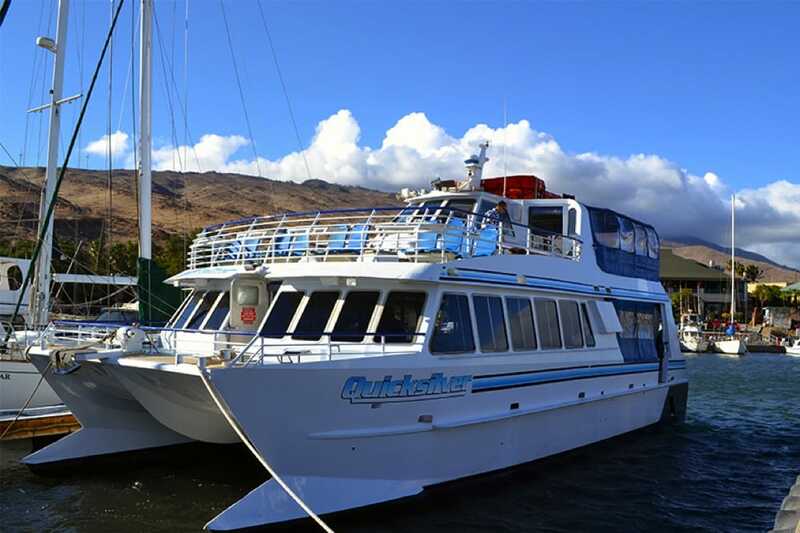 View a unique Maui sunset aboard this safe and comfortable ocean sailing catamaran. Throughout this two-hour journey, enjoy breathtaking views, an active ocean environment, and a delicious assortment of complimentary appetizers and beverages made just by our crew. Our cruise provides the most romantic way to experience the beauty of a Maui sunset. We serve an assortment of hot and cold appetizers that are guaranteed to satisfy the most discriminating gourmet. 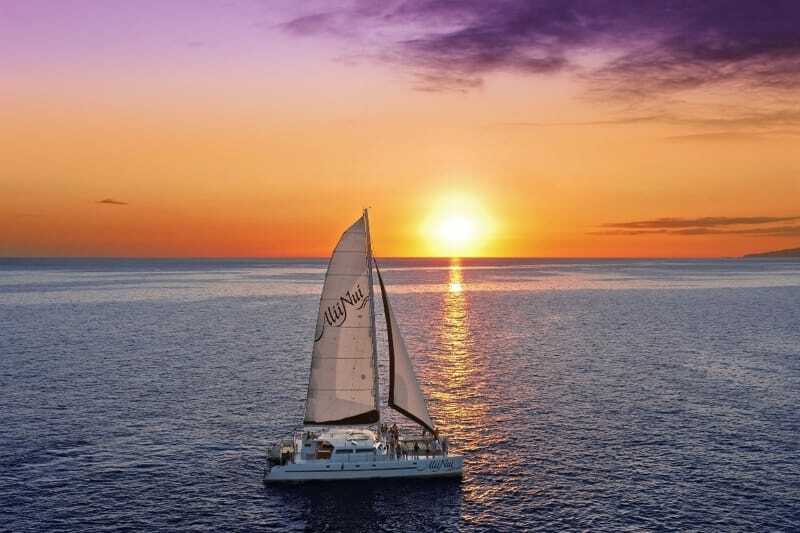 With breathtaking views of Molokai and Lanai, spinner dolphins and flying fish, this two-hour Maui sunset sail is relaxing, delicious, and romantic! Kona Coffee Mousse topping will be served for dessert. For guests ages 21 years and older*, we offer a premium bar which includes: Molokai Mule, Lanai Tai, Locally Brewed Beer, and White Wine. * I.D. must be present. My family of 4 went on the Deluxe Ka’anapali Sunset Sail and had a fantastic time. The beach load was very easy to manage even with a 1 and 4 year old. Once on board, the crew provided us with a couple of rounds of delicious appetizers - hummus, tomato and mozzarella skewers, pork sliders, crab cakes - and a great selection of local beers and cocktails. The service was top-notch and the large catamaran was as comfortable as it gets. You can sit up front at smaller tables for two or spread out a little more at the tables at the back which is a perfect option if you’re with kids. This 2 hour sunset cruise was everything we hoped for and more! What an incredible crew and cruise/sail. Amazing service from docking on the beach and loading us to landing on the beach at the end of the cruise. We were able to sail with Britney, Justin, Sidney, Gabe and the Captain. They took time to take photos of all on board all while serving each quest bottomless crafted cocktails and appetizers. They even adopted my son as one of their own crew... If you are looking for an enhanced sunset on the water you can't go wrong with this crew or boat. Family wedding in Maui. Night before our large party went for a sail. We loved it. The crew Bo, Justin, Britt , Gabe and Kevin were awesome. We enjoyed talking to the captain who was very friendly and helpful 're tips for Maui. The appetizers were very good. The sunset on the ocean was beautiful. Reasonable prices.